T. L. VEST, a prominent farmer of Mulberry Grove Township, resides on section 35, Bond County, Ill. He was born in Alabama, September 9, 1825, and was the son of Rev. James Vest, a native of Tennessee, born in 1801, who was reared in that State but went to Ohio when a young man. He there married Phoebe Corwin, born in the year 1796, a native of that State, and a second cousin to Tom Corwin. Her father was a soldier of the Revolutionary War. The Rev. Mr. Vest and wife removed to Dayton, Ohio, and then to the State of Alabama, and from there to Indiana, where they remained thirteen years. 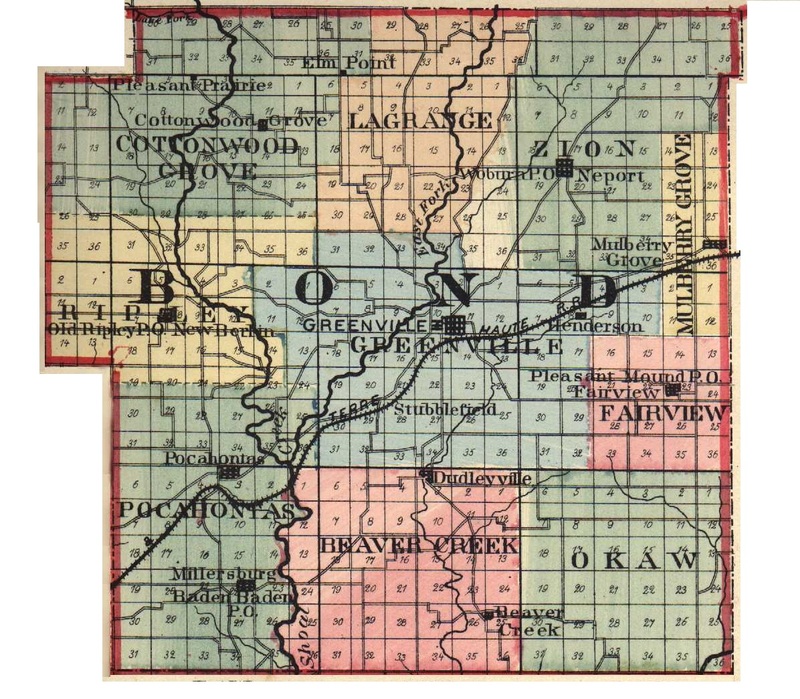 In 1839 they came to Bond County, Ill. The father was a minister of the Southern Illinois Conference of the Methodist Episcopal Church, and died in Mascoutah, St. Clair County, in 1856, and was buried at Lebanon, Ill., in the Ministers' Cemetery. The mother of our subject, after her husband's death, lived quietly at Mulberry Grove, and died at the age of seventy-two years. Five sons and as many daughters had been born to them, and four sons and one daughter grew to maturity, but three of this family are all that now remain. Mr. Vest is the third child and son of the family, and his first school experience was at Fairview, where his father had been induced to take charge of the school in a log house. Our subject's education was finished at McKendree College, at Lebanon, Ill., and so thorough had been his training that at the age of twenty-two years he was considered an excellent teacher. The career of an instructor he continued for thirty years, although part of the time he carried on farming during the summer and teaching during the winter. September 13, 1849, was the date of his marriage to Miss Nancy, the daughter of Rev. James B. Woolard, who was born in Maury County, Tenn., February 22, 1828. The last-named person was born December 17, 1804, in North Carolina, and was reared in Tennessee, where he became a Methodist minister and joined the Southern Illinois Conference. He became one of the most prominent ministers in the country, was a good singer, and this aided him greatly in carrying on his-revivals. Mr. Woolard came to Greenville in 1829, and located on the same place where our subject now lives, and in 1834 joined the Conference. In 1862, Mr. Woolard was made Chaplain of the One Hundred and Eleventh Illinois Infantry. He was well known in the church, a hard worker, and a man that did a great deal of good. His life ended May 5, 1887, and he was buried at Mulberry Grove. Through his influence the first schoolhouse was erected in the eastern part of the county, and his grave is now located in the schoolhouse yard. During the Black Hawk War he was a soldier, and at one time was a member of the Legislature. In politics, before the war he was a Democrat, but after the war just as strong a Republican and a strong temperance man. The father of Mr. Woolard was Willoughby Woolard, a native of North Carolina, who went into the Revolutionary army at the age of sixteen; and his father was John Woolard, also a native of North Carolina, of Welsh descent. Mrs. Vest's mother was Mary McCurley, a native of Kentucky, born March 24, 1805, and reared on a farm. She lived until 1883. Her father, the grandfather of Mrs. Vest, was Abraham McCurley, and her Grandfather Brown was a soldier in the Revolutionary War, Mrs. Vest's father and mother were the parents of six children, all of whom lived and grew to maturity. They all had families, and all of the grandchildren were born before there was a death in the family. Mrs. Vest was the eldest child of her family, and the only one who was not born in Bond County, and on the farm here she now lives. She was two years old when she came to Bond County, and her first attendance at school was when she was five years old, at a little log schoolhouse. She finished her education at Hillsboro Academy and then at Blackburn Seminary, at Carlinville, Ill., in 1840. Mrs. Vest taught two terms of school, and then married Jesse P. Henninger, and had one son, Jesse P., who took part in the late war. Mr. and Mrs. Vest are the parents of five children, viz. : Eugene W. was born December 17, 1850. He attended McKendree College at Lebanon, Ill., and also went to school in Greenville, and after that taught school for several years, but now he is in the employ of the Steel Range and Furnace Company of St. Louis, and is in the State of Washington. Americus D. C. is the next child, and was horn July 24, 1852. He completed his education at Greenville, and is now engaged as engraver at Springfield, Ill. Thomas A. was born December 8, 1854, graduated at the High School of Greenville, and at the Law School in the Washington University at St. Louis, and taught school here and in California. He is now in San Francisco, Cal., practicing law. Alice V. was born April 24, 1856, finished her education at Greenville, Ill., and taught four years in the public schools of that place. She married E. V. Buchanan, and resides at Waverly, Ill. Mary E. was born February 7, 1863, graduated at Greenville, and taught school until she married J. W. Brown, a prominent lawyer of Evansville, and they reside in Greenville. Mr. Brown was formerly Special Pension Examiner at Washington. After marriage, in 1849, our subject located in Vandalia, and engaged there as a clerk for one year. He then bought a farm in Mulberry Grove and located on it for two years, but in 1854 opened a store in the village. Mr. Vest has owned seven different farms in Bond and Fayette counties. He lived eighteen years in Greenville, previous to coming where he now resides. In 1889 he bought the old homestead of Rev. James B. Woolard, and now has one of the prettiest places in Bond County. August 13, 1861, Mr. Vest enlisted in Company C, Twenty-sixth Infantry, under Col. Loomis, of Chicago. He was made Lieutenant of Company C, but on account of disability he resigned in 1862. For years Mr. Vest has been a Republican, but at present he votes with the Prohibitionists. While living in Greenville, he was an Alderman, and he served very creditably in that capacity. He has been a member of the Methodist Episcopal Church since he was sixteen years old, is a prominent worker in the Sunday-school, of which he has been Superintendent, and has been Class-leader and Steward of the church. Mrs. Vest also is a member of the Methodist Episcopal Church, to which she has belonged since her eighth year. Both Mr. and Mrs. Vest are excellent people, and enjoy the respect and esteem of all who know them. Extracted 20 Dec 2016 by Norma Hass from 1892 Portrait and Biographical Record of Montgomery and Bond Counties, Illinois, pages 382-384.